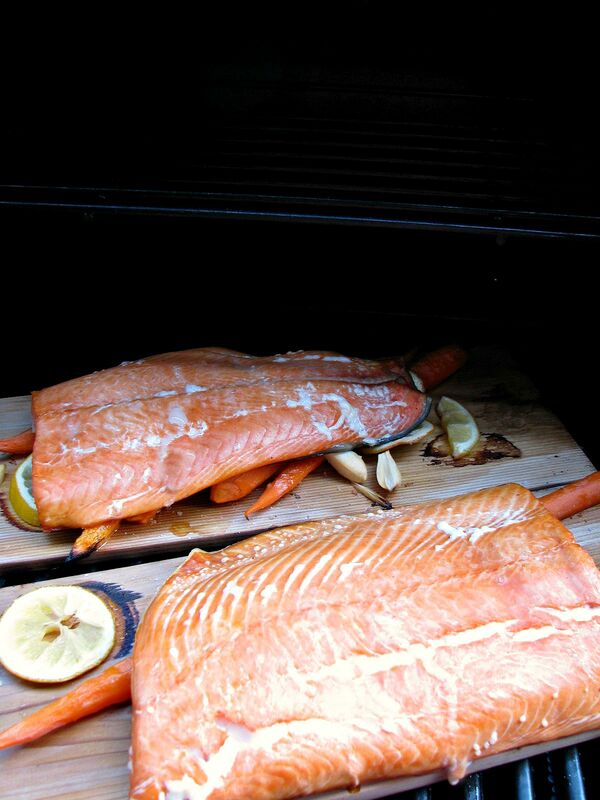 If you love salmon as much as I do, you will love this really easy Grilled Cedar Plank Salmon recipe. Good salmon doesn’t need much to make it delicious, in fact over-seasoning can ruin it. The only flavors you will find here are from carrots, garlic, and lemon slices placed on top of the cedar planks before the salmon. I’ve been horribly absent this summer. Between normal summer activities, house work, and our first family vacation to Wildwood Crest, I haven’t been sharing new recipes. I had lined up a few guest posters, but then I lost my entire email list and couldn’t find who was supposed to post or when. Plus, I had already decided that I wanted to just concentrate on spending time with my 6 year old daughter, Amanda, this summer. So that’s what I have been doing. I’ll share some of our summer photos in September when I come back to more regular posting. Back to this wonderful salmon, this recipe uses a whole salmon fillet, and would easily feed up to eight people served with some side dishes like Sriracha Slaw or Easy Garlic Fries. 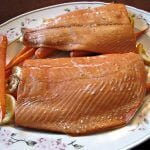 If you don’t like salmon, I originally shared this recipe on Community Table, Grilled Cedar Plank Salmon Plus 7 Fabulous Grilled Seafood Recipes To Make This Summer, where I included links to recipes for Grilled Wild Scallops, Swordfish, and more! Simple yet flavorful cedar plank salmon with carrots, garlic, and lemon. Great for summer grilling! Soak cedar planks for at least two hours. Longer is better! Place carrots, garlic, and lemon slices on a plate and drizzle with olive oil. Pat the salmon fillet dry, cut in half to fit the planks. Heat grill to high (350-400 degrees F). When hot, place the planks on the grill for about 5 minutes, or until they lightly smoke. 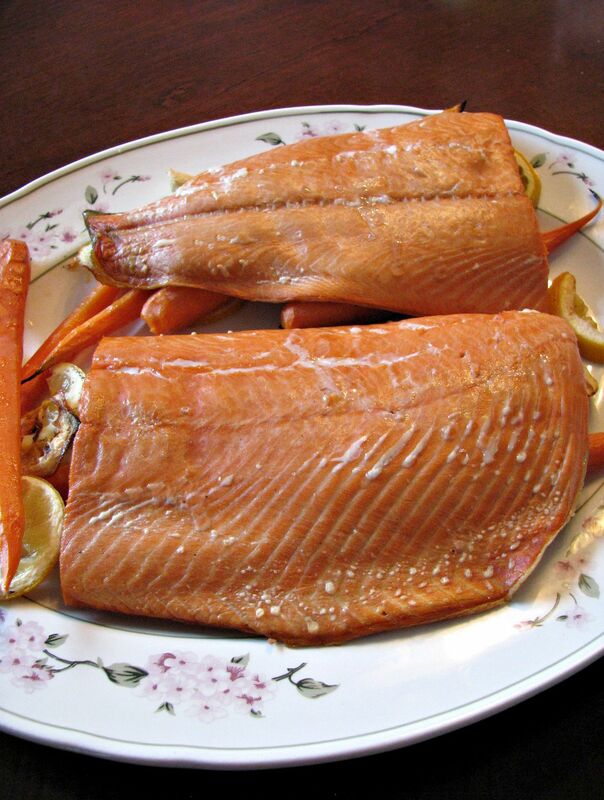 Layer the carrots, garlic and lemon slices on the planks, place salmon pieces over carrots. Close the lid and cook, checking every so often for flare-ups and spraying the corners of the planks with water if needed, for about 20 minutes, or until the salmon is cooked through (135 degrees) and the carrots are tender. Serve with the grilled carrots and garlic on the side.